We are smack in the midst of apple season now, and I’m loading up on them every week at our local markets. Nowadays, you can find excellent quality apples at almost any grocery store, reasonably priced. It’s also fun to experiment with heirloom varietals from Farmers Markets, but those apples can be pretty pricey here in San Diego. If I had to choose three top favorites, it would be Honey Crisp, Fuji and Gala, in that order. I like an apple that is firm to bite into and juicy enough to run down my chin. Cooler fall weather reminds me to restock on autumn chutneys, so I developed one that spotlights apples. I used fresh, organic Honey Crisps for this batch. Adding dried apple rings intensified the flavors of the chutney, although the dried fruit absorbed so much of the orange juice that I added an extra half cup from my original recipe. Dates added richness and the pomegranate anils give the chutney a bit of a spark. This first batch of my double apple chutney will be perfect for little hostess gifts and, later in the season, for stocking stuffers. Maybe I will surprise my writing group friends with a jar to sample at home…For a review of safe canning procedures, go to this link. TIP: Lazy Liz does not seed pomegranates. Instead, I buy packages of the seeds, or “anils”, at places like Trader Joe’s, where they are a seasonal item. One package is just about a cup, perfect for this recipe. TIP: If you don’t want to can the chutney, it will keep for at least four weeks in your fridge. I need to experiment with a future batch and try freezing some. 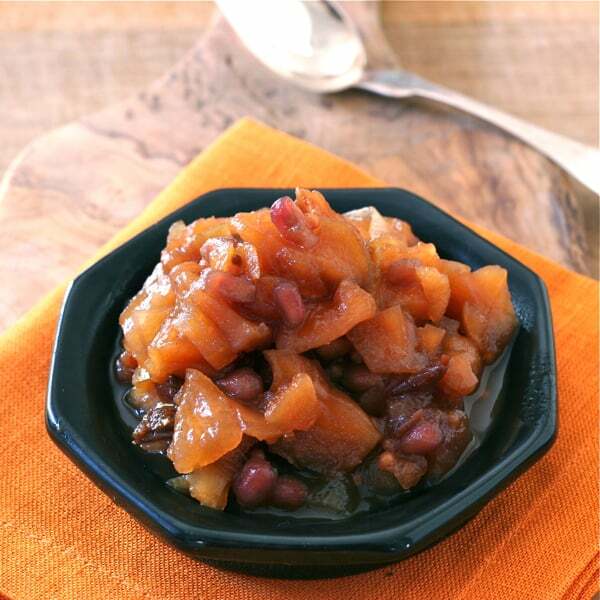 An apple chutney using both fresh and dried apples, as well as dates and pomegranate anils. Using a large, heavy-bottomed pot such as a Dutch oven, combine the sugar and vinegar. Bring to a boil over medium-high heat, stirring until the sugar dissolves. Add remaining ingredients, return to a boil, then reduce heat to low. Cook, uncovered, stirring occasionally, for two hours. Pour into sterile jars and process according to safe canning procedures. Keep in your pantry up to one year. Liz, I absolutely love this recipe. This will be so good with pork, you are so right it will make excellent hostess gifts or I would even include in my holiday gift baskets. Fabulous!! Oh Liz, this looks to die for! Love the addition of the pomegranate, I am pinning this so that I can try this out after my hoilday rush. I had hoped that the pomegranate seeds would retain their brilliant color – adding them later next batch. Oh my goodness, Liz! I love apples and love everything about this chutney. You are the Queen of Chutneys for sure. Honey Crisp is far and away my favorite apple too. It’s so versatile and has just the right crispness for cooking or raw. I’m also interested in the fact that you added dried apples. What a great, great idea! Pinning!! This sounds absolutely divine! I’m certain you’ve taken all of my favorite fall flavors and combined them into one sweet bite! Thanks, Kimberly – you made my day! I have a ton of apples sitting around just waiting around to be used, maybe I should do a chutney!! Definitely do a chutney – so easy and they really add something to simple dishes like roast chicken or pork tenderloin. Easier than making jam, for certain. Thanks, Abby – it’s been fun to get to know you through Pinterest, a whole new world for me – even though I don’t understand the analytics, etc. Love to be inspired by others’ fine photos.